Our great range of Robinsons greenhouses combine superb quality and strength along with a stylish un-beatable finish. This 5ft wide Robinsons greenhouse has been designed with the smaller garden in mind, ensuring that every garden can accommodate a Robinsons greenhouse. Finished in either plain aluminium or in a high quality green power coated finish, this greenhouse will add a touch of style along with practicality to your garden. The Robinsons Regatta Greenhouse is available in five lengths, from 4ft 6in up to 12ft 8in and comes as standard with features such as 4mm toughened safety glass fitted throughout to give you the reassurance that the whole family (including pets) will be safe, ground level access to prevent trips and to allow easy entry when using a wheel barrow, wheelchair or when carrying pots. Double sliding mini lockable doors are fitted to protect your belongings. The guttering and down pipes that are included are a great way to collect and save precious water to use around your garden. Kick panels are used below the full sheet toughened safety glass to prevent full pane breakage if you happen to accidentally kick or hit the glass with a stone when mowing. Higher 7ft 2in eaves are perfect for the taller gardener or when growing plants such as tomatoes or vines. The Robinsons Regatta Greenhouse is also fitted with a roof vent or vents ( depending on the length ) with automatic opener(s) that open and close during the day meaning you plants will be protected from overheating and scorching. 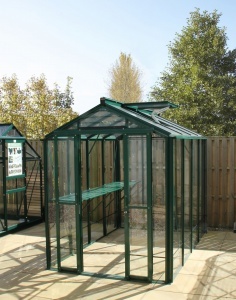 A great range of optional extras are also available, allowing you to make the best use of this fantastic greenhouse.